North Korean leader Kim Jong-un has announced plans to launch another intermediate-range ballistic missile capable of carrying a nuclear warhead within 24-hours. This will be the ninth test launch of a ballistic missile by the reclusive country this year. A state-run North Korean news agency and two unidentified U.S. officials have confirmed rumors of the launch. Their most recent test failed spectacularly on October 20th. The intermediate-range Musudan missile failed immediately after launch. These failures have done little to ease tension among North Korea’s immediate neighbors and U.S. military officials. Kim Jong-un claims that the nuclear and ballistic missile tests are strictly defensive in nature. The country has been pursing nuclear weapons since conducting their first test in 2006. They have conducted a total of four nuclear weapons tests since 2006. 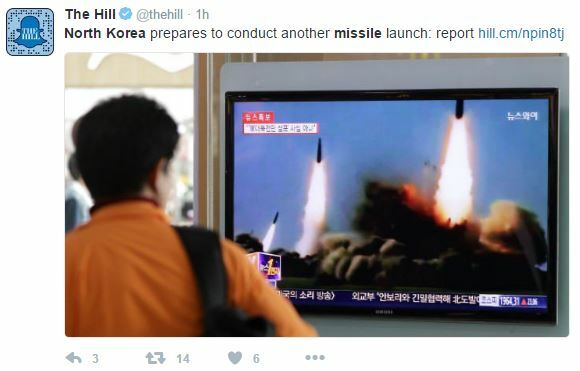 The test was announced shortly after Kim Jong-un released a propaganda video showing off his “war ready” military prowess. The dictator can be seen handling a gun, “flying” a plane, and observing military live fire drills. Kim Jong-un continues to defy international sanctions and shows no signs of slowing down despite one of their closest allies, China, showing support for the U.N. Security Council sanctions.